Be aware of the fire danger from space heaters and candles; keep such devices away from all flammable materials. Install recommended smoke and carbon monoxide detectors (at least one of each per floor in your home). Stay indoors and use safe heating sources. Indoors, do not use charcoal or other fuel-burning devices, such as grills, that produce carbon monoxide. Wear several layers of loose fitting, lightweight, warm clothing rather than one layer of heavy clothing. 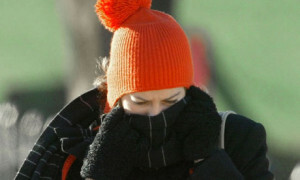 Wear mittens, a hat and cover your mouth with a scarf to protect your lungs. Drink plenty of non-alcoholic fluids and eat high-caloric foods. Watch for signs of frostbite– Skin appears white and waxy, numbness or no feeling in that area and/or possible blisters. Watch for signs of hypothermia– Shivering and numbness, confusion or dizziness, stumbling and weakness, slow or slurred speech and shock. If you or someone you know is experiencing signs of hypothermia or frostbite go to a medical facility immediately.